Ingredients: Big glass Mason jar, Two 12 inch long cucumbers (you can also use baby cucumbers), fresh dill twigs, mustard seeds, whole black/colored peppercorn, Kosher salt, White wine vinegar, water, Coriander (optional) , Anise seed (optional), garlic cloves, Bay leaves. 0. Sterilize the jars: Take a big pot of hot water and bring to a boil. Then take your mason jar/s and sterilize them inside and out including the lids. Extremely important to avoid bad bacteria and germs. 1. Prep cucumbers: Take your cucumbers, cut off the ends (super important). Then cut into spears. See photo for details. 2. Pickling brine: Take 2 cups of water and 2 cups of white wine vinegar, and two tablespoons of pickling/kosher salt and put into a pot and bring to a boil. Stir to make sure all salt is fully melted. (adjust amount of water and vinegar based on size of jar. My jar required 3 cups of both). 3. Add spices to the jar: While the water is coming to a boil, take these spices and put at the bottom of the jar: 1 bay leave, 3 crushed garlic cloves, 1 tbsp of peppercorn, 1 tsp of mustard seed, 1 dill twig, a pinch of coriander (optional) and a pinch of Anise seed (optional). 4. Add cucumbers & more spices: Take all of your cucumbers and stuff them into the jar as much as you can. Then add 1 tsp of peppercorn, 1 bay leave, 1 tsp of mustard seeds, 1 dill twig and 3 more crush garlic cloves to the top. 5. 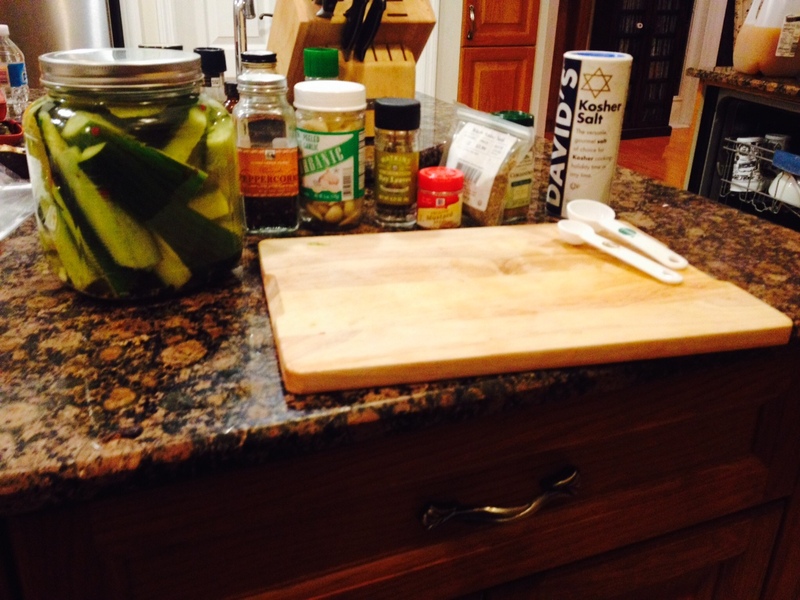 Pour in the brine: (salt, vinegar and water) over the pickles and make sure the pickles are fully submerged. Put the lid on and let sit until it gets to room temperature (generally 2-3 hours). If you want crunchier pickles, leave out for only 1 hour and then put into the fridge. 6. Stick it in the fridge for 18-24 hours and you will have delicious pickles! I’ve been wanting to write this out and just been really busy. This recipe can be used for any other type of meat. I prefer 8 hours on low in crockpot or 4 hours on high if you are strapped for time. 8 hours always tastes just a bit better. I’ve done this recipe with filet mignon, tri-steak (cut into perfect stew pieces) and meatballs. If I have other produce about to go bad in the fridge (tomatoes, spinach, asparagus, onions, parsley, cilantro and the like) I will add those too. Ingredients: 4 carrots, 4 celery sticks, 1 sweet yellow onion, garlic, paprika, pepper flakes, fresh tomatoes, salt, pepper, chicken stock, raw butter or grassfed and almond flour. You can add butter or oil to the crock-pot if you like that but I have had great success leaving it out. 1. Take 1/4 cup of fine almond flour in a mixing bowl and add a tsp of salt and pepper. 2. Take 1lb of grassfed or organic ground beef and mix it in the bowl until it’s fully covered and soaked up. 6. Take 2 tomatoes and put in blender until it’s a puree and put into crock-pot. 7. Take 3 garlic cloves and press them and put the pressed garlic into the crock-pot with the others. 8. Add 1/4-1/2 of chicken stock and add to the crock-pot, if you don’t have it, just add water. You may need to add more salt. 9. Take 1/4 tsp of Paprika, salt, pepper and pepper flakes and add to the crock-pot. If you like hot/spicy like we do, I add a tad bit more pepper flakes and it’s delicious. 10. Get a large saucepan and put it on medium heat. Add butter just enough to coat the pan. 11. While pan is heating up, take the meat and roll it into little balls and then put them into the medium saucepan and put a lid on them. The intention is just to brown the outer edges and makes them taste amazing. Shouldn’t be longer than 3 minutes. 12. Take the saucepan and add to the crock-pot, be sure to scrape off all oil from the pan and add to the crock-pot. 13. Take spoon and mix all ingredients together. Put crock-pot on low for 8 hours for a dinner or on High for 4 hours for lunch. I love, love, love this recipe. I take NO credit for this recipe because I didn’t make it. The only thing I’ve changed is added butter or tablespoon of olive oil. I didn’t like the sweet taste the coconut oil left. Whenever I have excluded oil the chicken was extremely chewy. So don’t eliminate. Well, it’s been a long time since I was last on. I just added a section on Bottle Weening/Sleep Training. I know I will be adding more to this. This was just a rough draft and I plan to finalize it over the next couple of days! Thanks for reading! Well, I haven’t been on here much other than to post up pages on my blog to help friends out who have questions or need some better direction on things. I am now 9 months pregnant and due to delivery my second baby March 11th. My Dr says it’s probably going to happen sooner, but we’ll see! As a mom, we all tend to get information thrown at us. The purpose of this blog is only to help lessen the amount of information being thrown at you and you being able to gather the information you need to make the best decisions for yourself. Each mom and baby is a separate set of situations and conclusions, so I am a firm believer that the mama finds out for herself and sees if it’s applicable to them! My husband went out of town to Monterey, CA for a Convention with CALSA (California Association of Latin Super-Attendants). He’s been going for the past three years. To surprise him for Valentines Day I had photographer, Kristy Mann take some maternity photos as well as photos of my daughter. I am so pleased with the outcome and I am eager to show my husband! We are heading down to Santa Monica to enjoy some great food at “The Ivy by the Sea” and then go to the Cirque du Soliel show, “Ovo” across the street. I am starting my own personal blog and going to document my experiences with health, running and raising my first daughter, Riley Aria. I hope to have more stuff up here son as I am just starting! I was fortunate to work with my mom who ran a nursery for over 10 years and I learned how to make formula, how to handle babies and how to raise healthy babies.